I TAKE THE scooter to the store a lot in the summer. Most of the time I park it on the sidewalk right in front of the store. Technically this is not legal, I guess. Yesterday we got a visit from a QPD officer. He wasn't happy to have his time wasted. "Somebody called and complained," he said. He wrote me a "warning" ticket. I had no idea the fine was $4,000! I better start saving my pennies. We are not positive who complained about it, but we have some ideas. The bottom line is that you can't park the scooter on the sidewalk, even though it isn't in the way and isn't bothering anybody. The law is the law. Parking around here is a bit of a sensitive subject. Do unto others .... but only for two hours at a time. Sheryl doesn't like it when I park the scooter on the sidewalk, either. She puts it by the yellow line in front of the store on the Maine Street side. We both have our reasons, and basically it's to keep a small scooter from sucking up a parking space on either Maine or Fifth streets. But. If you complain, and it's not legal, I will comply. 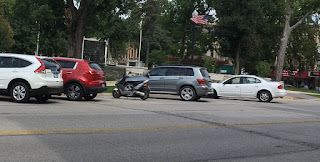 So I am parking the scooter on the street, and it's taking up a parking spot, and I'll move it every two hours so I don't get a parking ticket. Right.